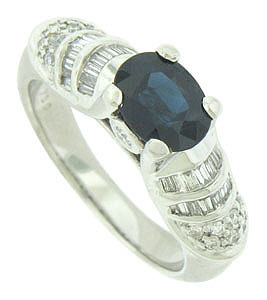 A magnificent oval cut sapphire is set into the center of this stunning estate engagement ring. Ribbons of baguette and round cut stones wind across the rings shoulders. Single round cut diamonds press into the center mount on either side of the center mount. 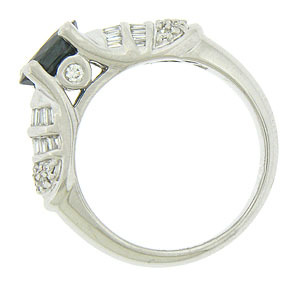 Fashioned of 18K white gold, the ring measures 6.32 mm in width. Circa: 1950. Size 7. We can re-size.